This is very easy to make and is convenient to leave in the oven while you prepare the main part of the meal. Heat the oven to 350°F or 180°C. 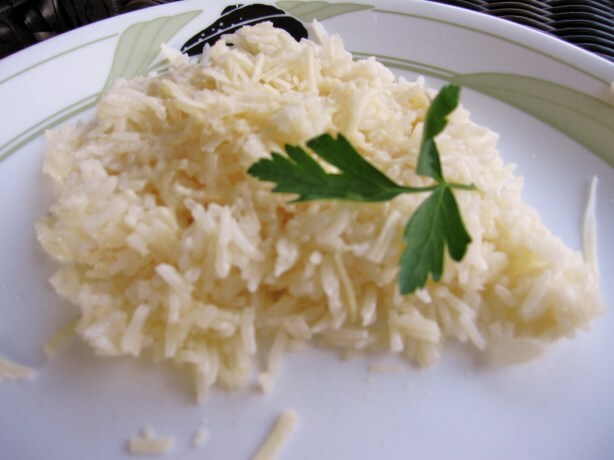 Put the rice, stock, cream, garlic and parmesan into an ovenproof casserole dish. Cover with foil and put in the oven to cook for 40-45 minutes. Check on the rice at 35 minutes- stir it gently and lay knobs of butter over the top. Re-cover and put back in the oven to finish cooking. When the rice is done- stir, serve immediately and enjoy!